Soon after I started using credit cards to earn points and miles, I realized that not all credit cards were created equal. While we’ve signed up for various types and brands of credit cards over the past few years, the Chase Sapphire Preferred card is still my favorite. It’s such a versatile card, from its various ways to earn and redeem points to its expansive list of travel partners. The Chase Sapphire Preferred card is the first card I recommend to anyone looking to get into rewards travel. The Chase Sapphire Preferred card has a great signup bonus, earning you 50,000 Chase Ultimate Rewards points after spending $4,000 on purchases in the first 3 months from account opening. Depending on how you redeem your Ultimate Rewards points, the signup bonus alone can be worth up to $625 in free travel. You can also earn 5,000 more points if you add your first authorized user and they make a purchase within the first 3 months from account opening. Be careful adding authorized users, as being an authorized user can possibly count towards your card count under the Chase 5/24 Rule. Also be aware that, according to Chase, this product is available to you if you do not have any Sapphire card and have not received a new cardmember bonus for any Sapphire card in the past 48 months. Beyond the initial signup bonus points, Chase Sapphire Preferred can earn you Chase Ultimate Rewards points a few different ways. With the Chase Sapphire Preferred, you earn points through spending on your card. Currently, you earn 2x POINTS on travel and dining at restaurants both in the U.S. and abroad. Beyond that, you earn 1 point per $1 spent on all other purchases. These points can add up quickly, especially if you travel or eat out frequently. Even your daily Starbucks trips will earn you 2x points. So will expenses like parking, tolls, and Uber rides. One of my favorite ways to earn Chase Ultimate Rewards points is through their online shopping portal. If you do a lot of online shopping, this can become a great source of extra points for you and your family. In the Chase Online Shopping Portal, you will find hundreds of stores that you already shop at and love, like Staples, Best Buy, Walmart, Old Navy, Dicks Sporting Goods, and more. They have featured sellers, but you can also search their portal for a particular company. The amount of points you earn depends on the store. The online shopping portal is easy to use. Instead of going straight to the store’s website, log in to your chase account, go to the online shopping portal, find the store and click the link. From there it will take you to the store’s website and then you just shop as you normally would. By using the online shopping portal first, it tracks how much you spend and then rewards you with bonus points eventually. You can log in to your Chase account to see what rewards you have received. Basically, you are just adding an extra step to your online shopping that takes less than a minute, but rewards you with Chase Ultimate Rewards points for your time. It’s simple to use. Any time we need to buy anything, I always check to see if I can earn Chase Ultimate Rewards points first. Let me give you one example of how we Chase’s online shopping portal. Our family does much of our grocery shopping at our local Walmart. We’ve been taking advantage of the Grocery Pickup service they recently added. It’s such a great program, plus it keeps us from overspending because we bypass all those extra items we would normally grab as we walk the aisles. What’s great is now I can log into my Chase account, click on the Walmart link in the online shopping portal and then order my groceries, just like I would normally, and earn points both for using the portal and then for my grocery purchase as well. 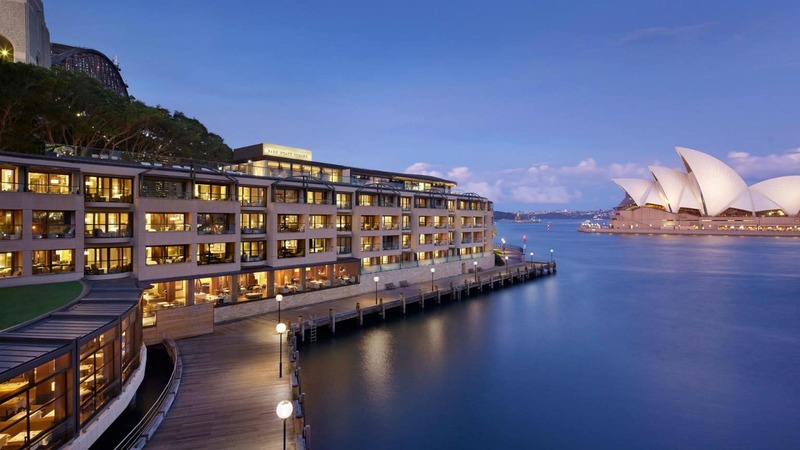 Transfer Chase Ultimate Rewards over to Hyatt and book an adventure at Park Hyatt Sydney for a once in a lifetime experience. The Chase Ultimate Rewards program gives you multiple ways to redeem your points. However, the travel redemptions are worth way more than other redemptions available. Let’s walk through the options available and their value. You can purchase various gift cards with your Chase Ultimate Rewards Points. Each point is worth 1 cent when purchasing gift cards so your 50,000 points from your Chase Sapphire Preferred sign up bonus can get you $500 in gift cards. That sounds great, and I know my kids would love $500 in gift cards at their disposal, but it’s not that great when you compare this to Chase’s travel redemptions, which have a far greater value. You can also receive cash back for your points via a statement credit. Similar to redeeming gift cards, points are worth 1 cent each when using cash back redemption. Your 50,000 Chase Sapphire Preferred sign-up bonus is equal to a $500 statement credit. One of the best redemption values is the redeem your points using Chase’s travel portal online. Your Chase Ultimate Rewards points are worth 25% more when using this option compared to gift cards and cash back redemptions. Your 50,000 Chase Ultimate Rewards points are worth $625 through the travel portal, a value of 1.25 cents each. Chase’s travel portal is set up similar to travel websites like Expedia or Kayak, allowing you to book flights, hotels, cruises, and rental cars. Booking travel directly through Chase is a great way to maximize the value of your Chase Ultimate Rewards Points. 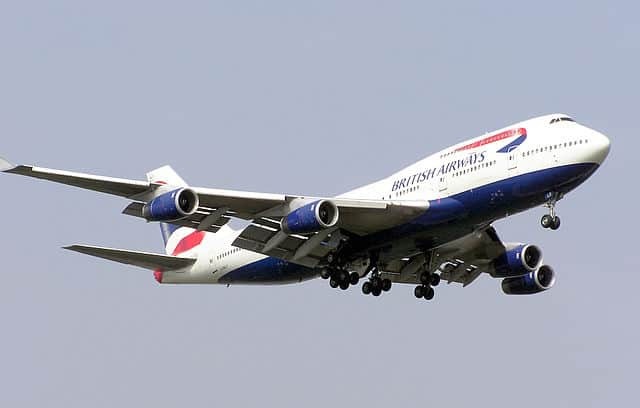 Transfer Chase Ultimate Rewards to their transfer partner, British Airways, for free flights for your next family adventure. Photo By Adrian Pingstone. It’s often overlooked, but Chase’s Ultimate Rewards program is great because you will never get stuck with points you can’t use. If you were to get a hotel or airline brand credit card, you can only use those points with that hotel chain or airline. With branded credit card points, you might be subject to flight blackouts. Perhaps the specific hotel doesn’t have any rooms available during your intended stay. You could be left holding points you can’t use at all. Chase Ultimate Rewards points are super flexible. You can search for flights or hotels before transferring points to make sure there is availability. With 13 travel partners, you have plenty of options to choose from. Some transfers can take up to 48 hours, depending on the travel partner, so plan ahead if you are using this option. Beyond redeeming Chase Ultimate Rewards points for free travel, the Chase Sapphire Preferred card offers many other valuable perks that make it a great card to keep in your wallet or purse. Some rewards points programs have points that expire after 12 months (or more) after earning. Others measure by periods of inactivity. With most programs, you can keep your points from expiring by earning or redeeming points in the program. With Chase Ultimate Rewards you don’t have to worry about any of that because your points don’t expire. You can redeem your points whenever you want. This is especially helpful if you are saving points up for a large redemption, like a big family vacation somewhere overseas. With the Chase Sapphire Preferred card, you receive valuable travel protections. While you hope you never have to use most of these perks, it’s nice to know that Chase has your back when traveling. One other travel perk is no foreign transaction fees. If you travel abroad often, you know how expensive those fees can get. 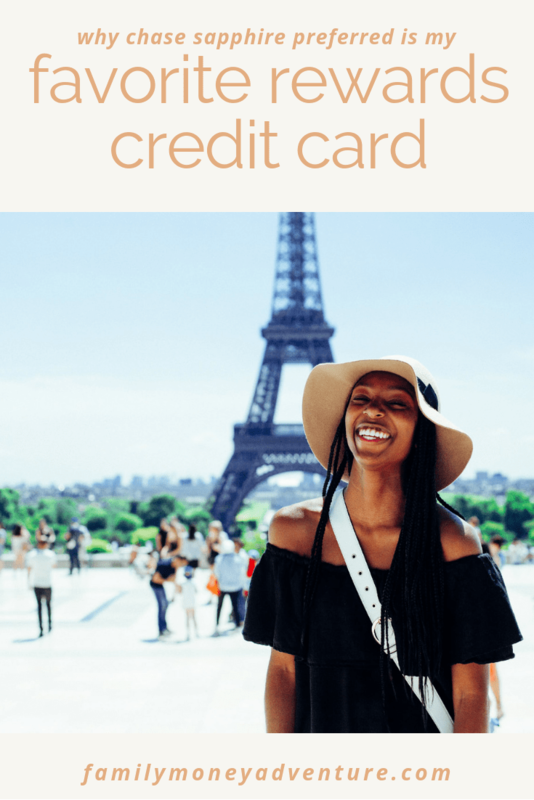 While the Chase Sapphire Preferred card is a great credit card to use beyond the initial minimum spending requirement, one thing you can do that will maximize your Chase Ultimate Rewards points is pair it with the Chase Freedom card. With the Chase Freedom card (see review here) you earn 5% cash back on quarterly bonus categories and 1% cash back on everything else. If you only have the Chase Freedom card, your only option is cash back through a statement credit. However, pairing it with the Chase Sapphire card allows you to convert your cash back earning over to Chase Ultimate Rewards points, which have more value. You can continue to use your Chase Sapphire Preferred card for everyday purchases and use the Chase Freedom card for spending in your quarterly bonus categories (or both) and earn even more points. The Chase Freedom card has no annual fee so it’s the perfect partner card to the Chase Sapphire Preferred card. Want to know what’s better than a 50,000 point signup bonus? A 100,000 point signup bonus! Maximize your Chase Ultimate Rewards points by having your spouse sign up for their own Chase Sapphire Preferred card as well. Just remember that you have to hit the minimum spending requirement for each card separately so if you don’t do that much spending, stagger your sign ups so you can still earn your bonus points on each card. 100,000 Chase Ultimate Rewards points are worth a ton of free travel! 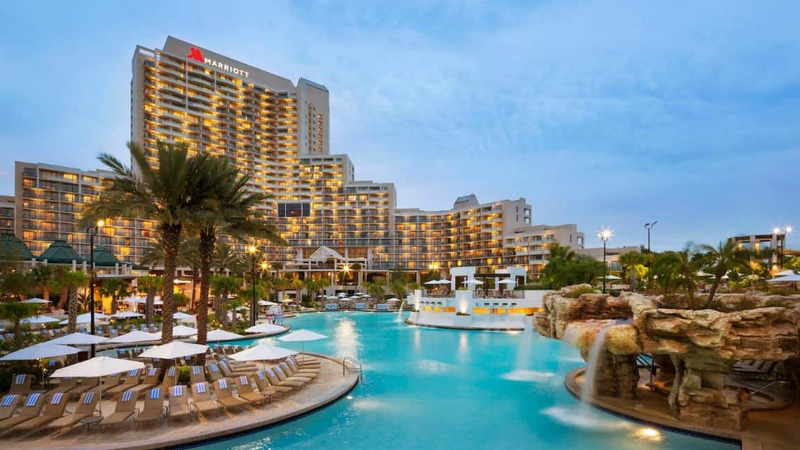 Use Chase Ultimate Rewards to book your next family vacation to the Orlando World Center Marriott. 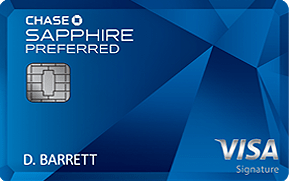 The Chase Sapphire Preferred Card does have an annual fee of $95, which is waived for the first year. If you get to the end of the year and don’t want to pay the annual fee, you can cancel the card. Personally, the Chase Sapphire Preferred card is one of the credit cards that provides value beyond the annual fee amount so I would keep it personally. It’s that good. The Chase Sapphire Cards has one of the most valuable sign up bonuses available. Because of that, it also has a larger spending requirement than many credit cards. The minimum spending requirement is $4,000 in the first 3 months. It is a bit steep, it is certainly attainable without too much work. This card comes with one of the most valuable signup bonuses around, it also comes with one of the largest spending requirements. There are ways to work the system if you are having an issue reaching the minimum spend, but we were able to hit it with normal purchases we were already making and paying bills by credit card. We bought gas, groceries, clothes, birthday and Christmas presents, as well as using the card to pay monthly utility bills (when it was an option), pay kids’ sports and school fees, and even tithe at our church (who had recently started an online giving program). You should never make purchases just to hit minimum spending requirements. To me, that completely defeats the purpose of rewards travel. If you can’t hit the minimum spending requirements with normal spending, wait until you can. Another option is to wait until you have a major purchase to make or a home remodeling project that allows you to make credit card payments. We had our master bathroom remodeled last year and the contracting company allowed credit card payments. We paid with our credit card and then paid off the card (as soon as the charge showed up) with the money we were using anyway and earned tons of points. Spend time thinking of ways you already spend money every month and see how many can be paid for with your Chase Sapphire preferred first in order to help you reach that minimum spending requirement. The Chase Sapphire Preferred card is my absolute favorite travel credit card I’ve ever carried. It’s one of the most versatile credit cards available and Chase Ultimate Rewards is the most flexible points program. To me, it’s the perfect beginner credit card for individuals and families just starting out with rewards travel. What are your favorite ways to use Chase Ultimate Rewards points? Let us know in the comments below!